As avid app marketers and keyword optimization geeks, one of our biggest passions, beyond achieving stellar results, is cultivating an ever-deeper understanding of ASO and PPC optimization tactics. Hypothesis: based on how ASO works, our hypothesis was that placing keywords into an app's metadata will result in an increase in impression volume for those keywords, as compared to other keywords not contained within an app's metadata. Question: after seeing some strangely low impression volume for head terms, we wondered how well Apple's search popularity number correlates with impression volume. Our main KPI was impressions garnered over a 2 week time period, per keyword (impressions / keyword count). 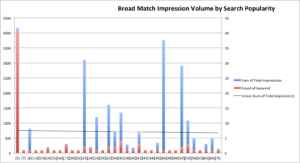 We omitted all branded keywords from the study to prevent impression skewing in the metadata test, and split the results into broad and exact match types, given the significant difference in volume driven by each match type. One annoying discovery actually caused us to have to re-pull the data: Apple assigns keyword with symbols (e.g. ampersands or dashes) a search popularity of 5, despite the fact that non-symbolized versions of the same keywords showing expected search popularity values. That is, brand name – tagline or brand name: tagline may both return a search popularity of 5, but brand name tagline may return a search popularity of 25. Given this issue, we actually realized that this was causing some of our exact match keywords to underperform from a volume perspective (i.e. app names missing the colon or dash), and subsequently audited our keyword list. We ran the app's title, description and KWs space through our internal keyword analysis tool to determine whether each search ads keyword was indeed a full or combined match to the words in our title, keywords space or description, and followed up with a manual review to ensure accuracy. We placed keywords omitting the word "app" or those using a close variant of a word that we confirmed was showing organic placements (e.g. tracker, if ranked for the keyword track) in the title/KWs/title & keywords category, as appropriate. Placing keywords into your keywords space or title is indeed correlated with better impression volume. Looking at the segment of the study controlled for a specific range of search popularity, it does appear that exact match keywords which appeared in the title or keywords space had better impression volume than those that did not. That said, broad match keywords bucked this trend. While the title held a better impression volume for both exact and broad match type keywords than any other placement in the non-search popularity controlled data, these keywords also had a higher search popularity, which could have explained this trend. 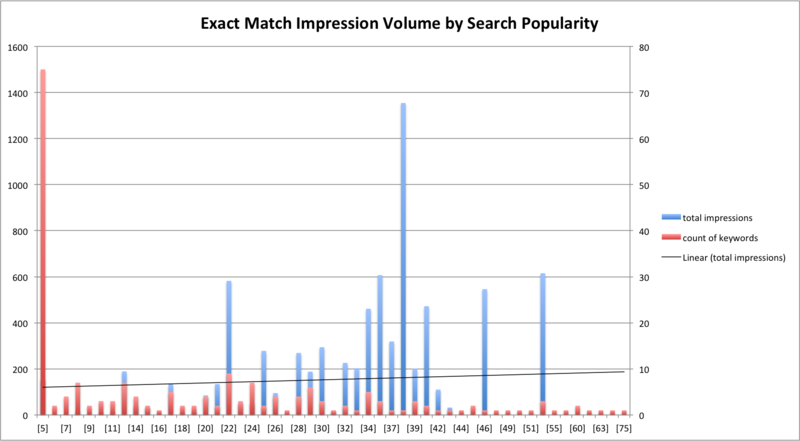 Search popularity is somewhat correlated in predicting impression volume for exact match types, but the same does not hold true for broad match types. 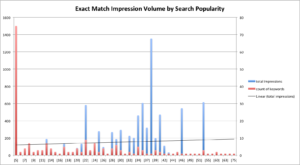 Search popularity was positively correlated with impression volume for exact match keywords, but negatively correlated for broad match keywords. A few search popularity = 5 broad match keywords actually drew hundreds to thousands of impressions (these keywords were not affected by the symbol issue). This makes sense, as broad match keywords are particularly broad, and Google's keyword tool predicts volume for exact match variants. Yet, we expected to see a higher correlation for exact match keywords. For high search popularity keywords which earn little-to-no volume, this underscores the need of an impression share statistic, to be able to identify potential volume and reasons for impression share loss. *When filtering for search popularity, we had to expand the range from 20-29 to 20-39 in order to capture more than 1 keyword in the range. We studied only one search ads account. 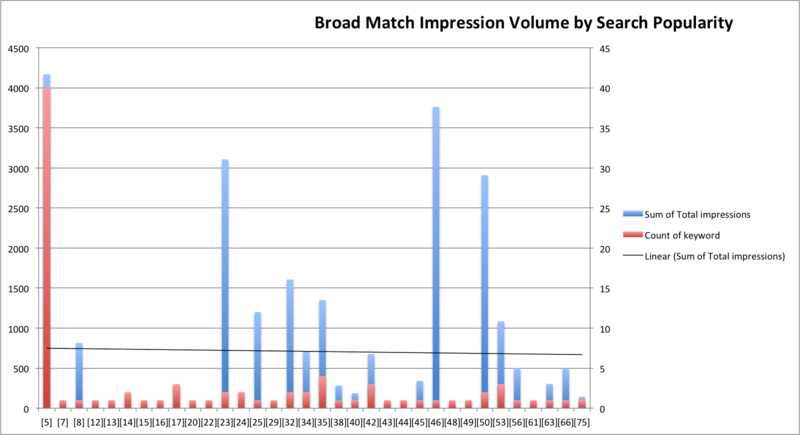 We only studied 204 keywords for exact match, and 88 for broad match. There were some changes made throughout the study's time period, which could have affected impression volume. We did not control for different bids in the search popularity vs impression volume data. Does mentioning a keyword's root word produce the same benefit (i.e. college for college scholarship app)? Does running ads against a keyword not ranked prior cause that keyword to rank organically? Does using keywords that return apps within the same category lead to better impression volume than keywords that do not?